I don't normally blog about make up, but as you know I do like to blog about making things, so I thought I'd include this fun and easy to do project. I prefer to lipglosses to lipsticks, but I've been tempted occassionally to buying lipsticks that I thought looked great in the store, but then don't quite look the same, once I got them home. I think the lighting in department stores are awful. The amout of times over the years, I have spent £12 on a lipstick, only to get it home, try it on and then thought, it looked much better in the store. Instead of just leaving those lipsticks to gather dust, I thought I'd turn them into lipglosses. Get your small container, mine is a free sample container I got from the Mac counter. 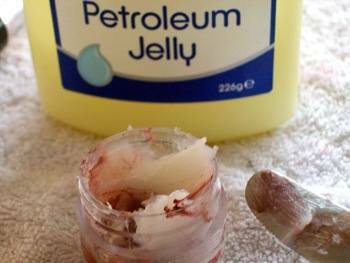 Cut off a piece of the lipstick and then add a tablespoon of the Vasaline. Add these to the small container and pop it into the microwave for about 30 seconds. 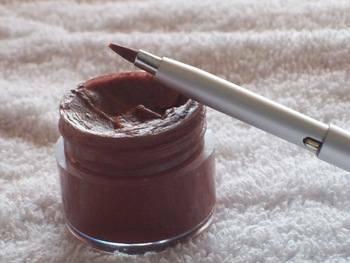 Remove and stir till both lipstick and Vasaline have been mixed to a smooth consistency. 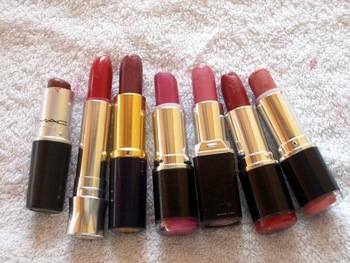 If you want your lipstick to have a stronger colour, add some more of the lipstick, if you want it to have a hint of colour, add some more Vasaline. 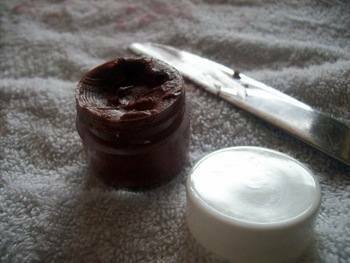 Pop the container into the fridge overnight, and then the next morning, you will have your very own homemade moisterising lipgloss. I've got a few more lipsticks to convert into lipglosses, which I'll be doing in the next few days, I'll have my own little stash ready for the summer. I find wearing lipsticks a bit heavy to wear when the weather is warm, so lipglosses are a welcome alternative. Well I finally finished my website and I published it. I'm soo glad, it has been a labour of love and it was worth it. Got to say near the end, I was tweaking like crazy, I lost count the amount of times I changed the colour of the banner, then I was not sure of the font, this went on for 2 whole days! Then I thought, stop it, this was getting rediculus, so I just publish it. I pressed the button and launched it on so on Thursday 26th April 2012 . I must confess I did do a teeny tiny bit more tweaking, what, don't shake your head like that, I can't help myself, call me a perfectionist, there is nothing wrong in wanting things to be perfect. I always think, if you going to do something, do it 100% and not 95%! Want to save 15% off your first order, (one time use) then sign up to my VIP list. You will receive news about new products and promotions, but also exclusive offers and secret sales, only sent to my VIP club members.